Please View My Short Informational Video Including Sound Vacation Rental Advice From Me, Your Go To Guy When It Comes To Arizona Vacation Rentals! VACATIONING DOESN’T GET ANY BETTER THAN THIS! How intimate? My family lived in this home ourselves for eight years, and it shows. Everything in this home is high-end, but not stuffy. We want you to be pampered…and, at the same time, feel right at home. Bring the whole family! Five bedrooms offer sleeping space for up to 19 people WITHOUT the use of air mattresses! This spectacular Arizona vacation rental is surrounded by breathtaking desert landscape that shows someone up there loves us. Take in the blazing blue skies during the day, sherbet-colored sunsets against Black Mountain (made infamous by the Gold Rush) in the evening, and nights spangled with stars. In fact, our spot in Cave Creek is so stunning, many upscale resorts and spas such as the Waldorf Astoria’s newest acquisition, called The Boulders Resort & Spa, the Four Seasons Resort & Spa, and a handful of other luxury properties all have chosen this immediate location for their own setting. We put you right in the middle of the striking beauty of the Arizona desert, and make sure the view is always close by. For a particularly extraordinary vantage point, check out the 360 degree observational deck on the roof. Our proximity to Scottsdale makes it easy to eat all of your meals in delicious restaurants that run the gamut from pub burgers to steak and seafood to chef owned & operated restaurants. But we highly recommend eating in at least once. If you like to grill out, boy do we have a place for you: a granite Teppanyaki cooking table—which is what you will find at hibachi restaurants like Benihana. Not sure about operating the Teppanyaki yourself? Don’t worry—let us recommend one of our talented in house chefs, who arrive armed with groceries, and prepare a delicious meal while you watch and luxuriate in our spa like surroundings. These professional chefs offer a wide range of epicurean delights, suited to your tastes! P.S.— The Teppanyaki table is also ideal for breakfast. How about cooking a few dozen eggs, pancakes, bacon and sausage for the entire group all at once? A whopping 30 people can eat outside under our covered patios. Relax on our luxurious outdoor living room with plush, overstuffed couches, chairs and ottomans. Our patios are complimented with high pressure misting systems to make the warm nights cooler and radiant ceiling mounted heaters to transform the cooler nights to cuddly warm! Gather around our sleek, stainless steel BBQ grill island with two large gas grills and even more seating! Other can’t-miss amenities include a huge great room with a fireplace and large-screen HDTV, plus a front yard replete with desert landscaping and a second dining area. A luxury bathroom with jetted tub provides a special place for you to sink with a glass of wine – you’re the one booking the vacation after all, go ahead and claim it! 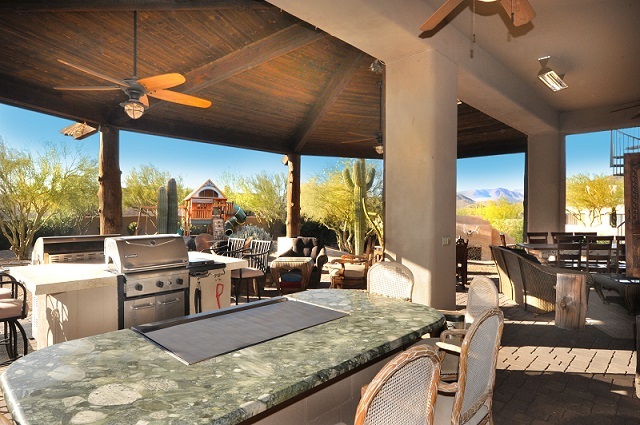 When you bring your friends and family to this Arizona vacation rental not only do you get to recharge in a home with spa-quality amenities, you also have access to a talented group of people who will improve your vacation with services such as your own personal chef, state of the art mobile kitchens, local limousine transportation, tour and expedition arrangements, and so much more. Room for everyone! 3700 sq. ft. home – Sleeps up to 19 in beds! Two resort-style “Climate Controlled” dining areas in the front and back with seating for over 30 guests. Enjoy the mountain and desert views while you dine! Plush, oversized sofas, chairs, and ottomans under our massive back patio—you’ll be protected from the weather because this area is covered! LARGE Great Room with switch-operated gas fireplace, sofas with some Southwest personality, and a leather recliner for the real lazy boy in your group. Room for everyone! 3700 sq. 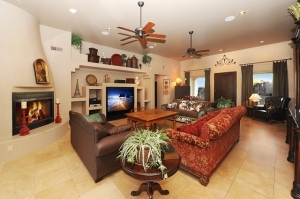 ft. home & covered patio bordering North Scottsdale, Carefree, Cave Creek, & Desert Mountain–wait until you see the views! Our reservation calendar for Cave Creek Spa Home fills fast! Please get in touch today to book your vacation! PLEASE CALL FOR THE FOLLOWING HOLIDAY’S & SPECIAL EVENT’S RATES… THEY ARE HIGHER! UNTIL CONFIRMED, RATES ARE SUBJECT TO CHANGE WITHOUT NOTICE UNTIL GUARANTEED BY A SIGNED CONTRACT and or BY RECEIPT OF PAYMENT or DEPOSIT.